Thanks to our range of wholesale LED lights and specialist expertise in design and installation, G&R Electrical Wholesalers are often approached for help across a broad range of projects. 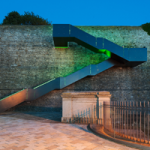 One of our most recent lighting projects began when KES (SW) Ltd approached G&R Electrical Wholesalers for assistance in implementing a LED lighting design to a development within the Royal William Yard, Plymouth for award winning developers Urban Splash. 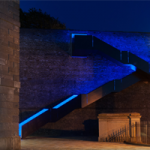 The plan was to illuminate the large Western King staircase, opposite the Clarence building, a historic feature of the yard. 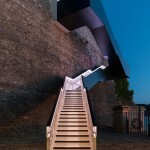 The architects design brief called for colour changing wholesale LED lights to be installed within the handrail box section, along each side of the whole flight of stairs. The installation needed to be vandal resistant and fully waterproof. After some deliberation with the KES team, G&R Electrical Wholesalers developed the idea of using a solid aluminium 45 degree profile housing with a 40 degree frosted diffuser to house the RGB (colour changing) LED tape. For the RGB LED tape, we assessed all the options available to us and settled on a bright, 14.4w per meter, high quality chip set LED driver from Epistar, with a high weatherproofing rating of ip65. KES used a short 3 meter section of the selected equipment to create a mock-up of this design which soon proved that this solution was going to give a smooth spread to our wholesale LED lights across the stairs. 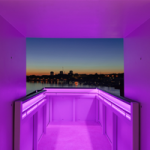 Following the electrical design calculation process, the installation was split up into four RGB LED tape sections using one 240watt Meanwell power supply unit per section. A 12mm aluminium pipe was installed adjacent to the LED housing section to provide the cable management solution for the supply cables needed for the two lower sections of the wholesale LED lights. It was then down to the installation teams at KES (SW) Ltd to build the control panel and deliver a quality, bespoke installation on a tight time scale. This project really allowed us to demonstrate the power of wholesale LED lights no matter what type of installation is required. Taking into account the prestige of the area itself, G&R Electrical Wholesalers were able to develop a design that was not only befitting of the environment, but also matched the budget and timescale we were allotted. Learn more about our lighting products and services by reading about our wholesale lighting today. Winter is coming…but do not fear! Another new product available at G&R Electrical! New LED profile in stock this week!! The answer to wireless home security is here! New Hager USB double sockets available! We are now stocking Nest home automation products! We’re a business full of success stories, and we’re happy to share them with you. If you’d like to hear more about our successful projects across our different specialisms, please don’t hesitate to contact us now – we’d be more than happy to share some of our stories with you.